In the 1890s and 1900s, size began to grow. Examples of hotels near the rail station and in the heavily residential area on South Division Avenue show the earlier scale. The 1913 Pantlind and the 1922 Morton House show what was coming in the way of hotels, bank buildings and other iconic structures of great elegance and size (both horizontal and vertical). The greater height was made possible by higher-speed elevators, and the growth of the city created a larger market for office space. Streetcars remained a primary means of transportation until the late 1920s, so the downtown contained the major concentration of business and professional life of the city. By 1910, the population had grown to 112,571. 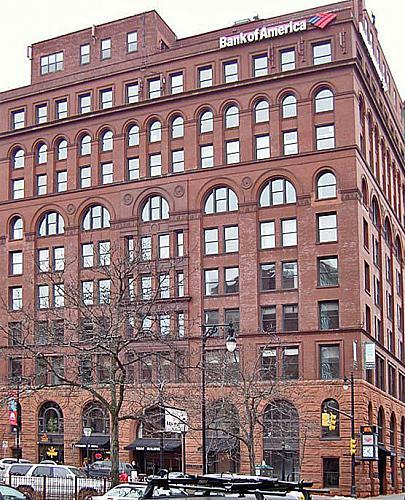 In this second decade of the twentieth century, architects were moving away from the “Chicago School.” They had learned how to design a tall building, with a strong one- or two-story base, a multi-story shaft above it with a vertical visual emphasis, and a large cornice to cap the composition. But they were returning to classical elements for the decorations: fluted pilasters, round arches in stone, decorative urns, and brackets In Europe, the neo-classical renaissance was institutionalized by the Ecole des Beaux Arts in Paris, the most famous architecture school attracting American architecture students. The heavily decorated style they favored became known as the “Beaux-Arts” style. Right across from the train station, the Waldron Hotel at 58 Ionia SW was aimed at the ordinary business traveler. Built in 1894, it is a good example of the earlier, small-scale hotel. It changed ownership and names, in 1926 becoming the Williams Hotel, the first in town to be owned by an African-American. 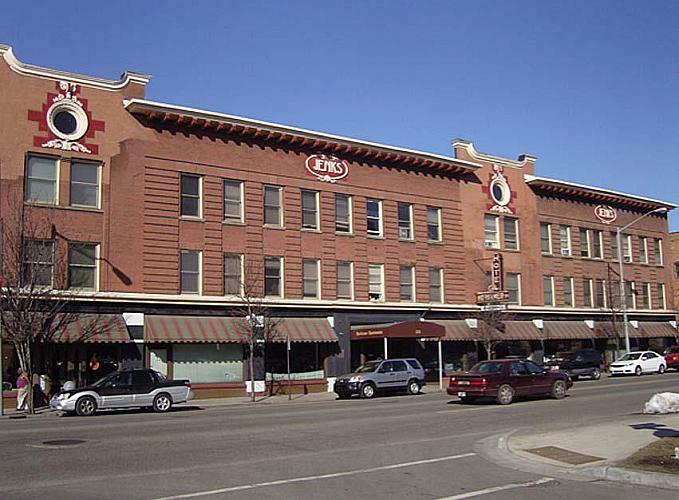 Built in 1905, the Herkimer (Jenks) Hotel was a residential hotel, in an area with many residential users along with commercial to serve them. 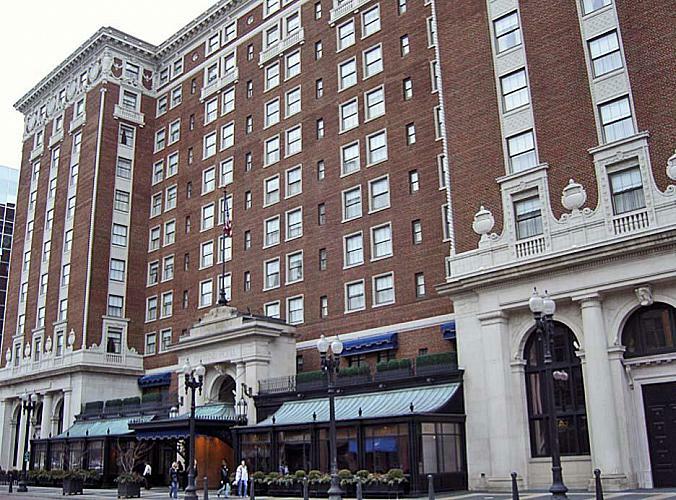 Aimed at a higher-paying clientele, especially those visiting the furniture market each year, the Pantlind Hotel was built in 1913. It replaced the historic Sweets Hotel (as well as additional buildings). It exhibits a size and elegance that puts it in another class of hostelry from those that went before. While showing a classical influence in its columns and arches, the decorative terra cotta elements give it a Mediterranean feeling. 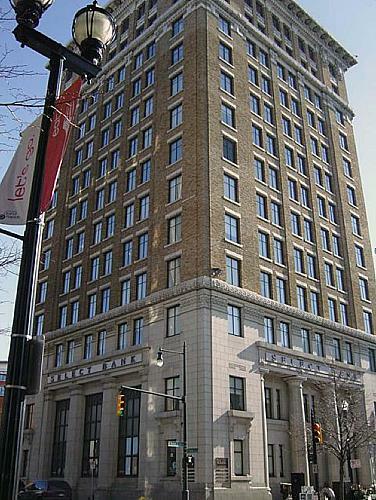 It included a two-story bank lobby at the corner of Monroe and Pearl. The Morton House of 1922 at 72 Monroe Center NW, also replaced an earlier Morton House building from 1873 (expanded and with added decoration in 1887). It was designed by the nationally-known firm of Holabird & Roche. Also neo-classical in style, it is more restrained than the Pantlind, but with a very strong two-story base in stone, with floors rising even higher into the sky. The base is marked by two large round-arched openings rather than with any columns. The ground floor was again home to a bank lobby. The large hotels included banks, but there were also structures focused on banks, with offices in upper floors. 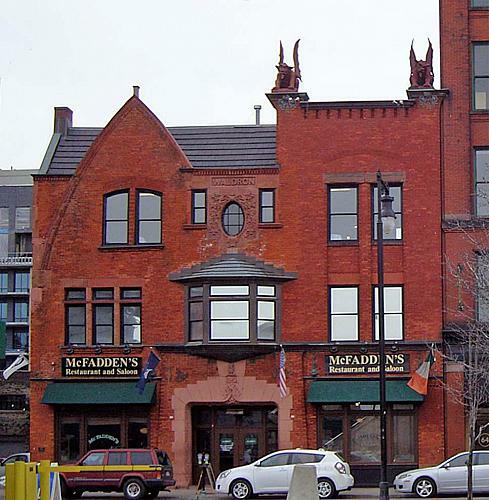 One of the earliest of the large ones, developed by a number of investors who were leading citizens of the city, was the 1892 Michigan Trust building, taking up at least a quarter of the large block bounded by Pearl, Ottawa, Fountain and Ionia, NW. This was a nine-story building, with a 10th story added later. It was designed by Solon Beman, an architect working in Chicago who is described as working “in the wake of the pioneers” of the famous Chicago School of late-nineteenth-century architects (See Bibliography, Condit, Chicago School, p. 143). Characteristic of that school are the pairs of large windows set off by four-story high pilasters ending in half-round arches; a rusticated stone base of two stories in height; and sparing use of decorative details which allows the muscular forms of the façade to dominate. 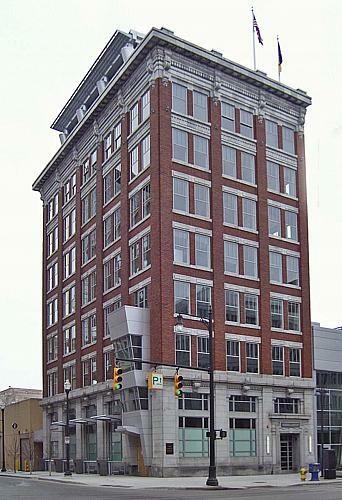 The bank, formerly Grand Rapids National City, at Campau Square became the McKay Tower. 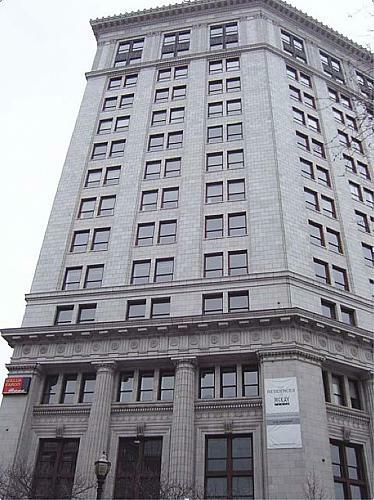 The three-story bank (including a tall second-story banking lobby) was built in 1911, with eleven stories of office space added subsequently. Named for the owner, Frank D. McKay, the most powerful political boss of the period, the simple classical detailing of the gray granite and matching terra cotta shaft make for an impressive structure. In 1916 the Grand Rapids Savings Bank built a tall new headquarters at 60 Monroe Center NW (later called the Peoples Building). Designed by local architects Osgood & Osgood, it also displays strong, simple classical details such as large columns and cornices. 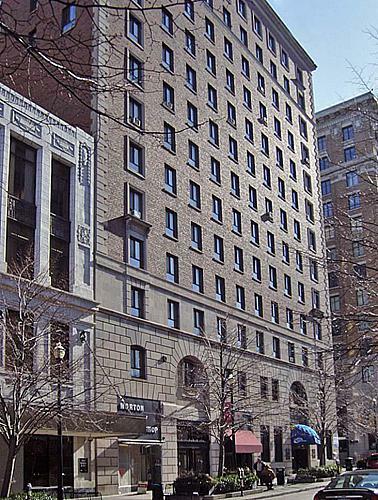 Becoming standard was the three-part treatment of the tall building: a three-story stone base, eight-story shaft with vertical emphasis, and a two-story crown with a large, overhanging cornice. Also from 1916 is the eight story Commercial Savings Bank built at 201 Monroe NW, just north of the Pantlind. It is similar to the People’s Building, but smaller, so the base and crown are shorter as well. The major difference is the greater transparency, with a larger percentage of the surface in windows. 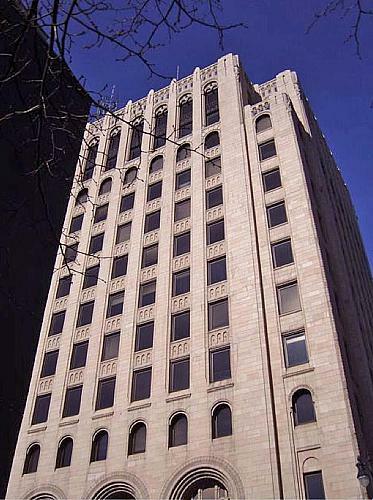 Another grand bank building was built in 1926–the Grand Rapids Trust eleven-story tower (later known as Michigan National), a tall Art Deco structure entirely covered in terra cotta tile. This twelve-story structure shows a break from the tall-building formula seen in the others, in several respects. The vertical lines are emphasized more and they run to the very top of the building. There are no projecting cornices dividing it horizontally, and the same material is used throughout. The base, shaft and crown are defined by differing window shapes and recessed decorative motifs. Some of those are abstracted “American” motifs, especially the sculpture of an Indian on the corner of the building. Carl W. Condit, American Building Art: The Nineteenth Century, New York: Oxford University Press, 1960. Virginia and Lee McAlester, Field Guide to American Houses, New York: Alfred A. Knopf, 1984. William J. Etten (compiled and edited), A Citizens’ History of Grand Rapids Michigan, Grand Rapids: A.P. Johnson Co., for the Campau Centennial Committee, 1926. James Van Vulpen, Grand Rapids Then and Now, Grand Rapids: Grand Rapids Historical Commission, 1988.